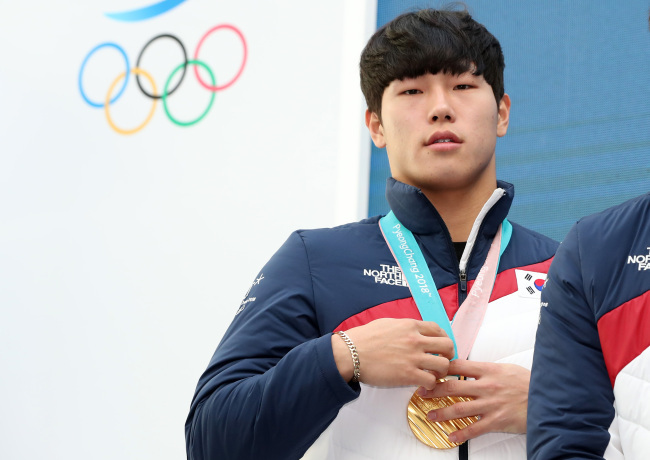 GANGNEUNG -- Now an Olympic gold medalist, South Korean skeleton slider Yun Sung-bin said Saturday he wants to see more of his compatriots standing on the podium at international competitions in the future. Yun became the first Asian to win a medal in sledding sports at the Winter Olympics after claiming gold in the men’s skeleton Friday. At Olympic Sliding Centre, he was the fastest one to cross the finish line in all four heats, with a combined time of 3 minutes, 20.55 seconds. Yun said he hopes to see his teammates stand alongside him on the podium in upcoming international events. In Friday’s competition, Yun’s teammate Kim Ji-soo took sixth place in his Olympic debut. Yun admitted that there was a home field advantage on his way to the gold medal. South Koreans reportedly made nearly 400 runs on the track before entering the Olympic Games. “A home ground advantage is strong in this sport,” Yun said. Following his historic gold, the 23-year-old said he was busy and has yet to throw a party. Yun’s achievement was also recognized by South Korean President Moon Jae-in, who sent a congratulatory letter to the slider for his hard work. Yun said that PyeongChang 2018 should be the beginning of a skeleton boom in South Korea, where the sport is relatively unknown to the public. “Starting with this Olympics, I think that we should really produce prospects who can do better than I in the future,” he said.